HBK: Who do people usually compare your sound to? 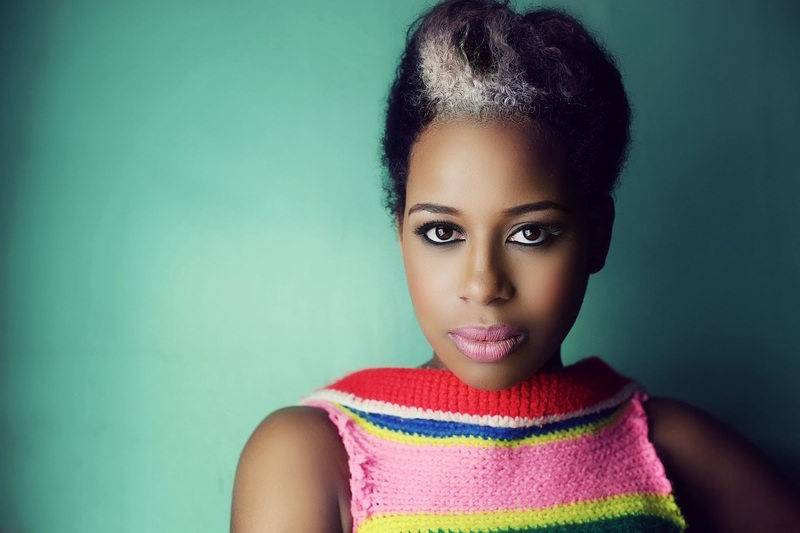 DEQN SUE:Although I have my own unique sound, it’s definitely a common compliment I receive to be compared to Kelis and Janelle Monae. HBK: What or who do you use as your muse when writing your music? DEQN SUE:My constant muse is a BIC blue ballpoint pen and a ratty black and white composition book. A blank sheet of lined paper and seeing inspiration in all things make for amazing possibilities. HBK: Why did you want to cover “Change the World”? What does the song mean to you? DEQN SUE:Eric Clapton’s, “Change the World” is one of my favorite tunes and it’s one of those songs that really make you believe you truly can change the world and do better and I think everyone wants to feel that at some point. HBK: When people hear your music what would you want then to take from it? DEQN SUE:My music comes from a place of aspiring to inspire and ultimately I think we should always seek to be better as people, better to each other, and better to the environment. HBK: How long have you been singing? DEQN SUE:I honestly don’t know how long I’ve been singing. That love affair started many moons ago. I’ve always been drawn to singing and performing and my parents fostered that passion. HBK:What projects are you working on now? 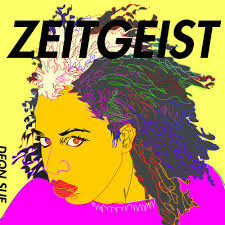 DEQN SUE:Currently putting finishing touches on my debut full-length album, “Zeitgeist”, due to release July 2014. On Friday, March 28, 2014 I got to sit with Corduroy Jones, Mike Dolla and the Host Mara Hip-hop Socialite of the “Gone Fishin” listening event. We were seated in one of the rooms at the Platinum Sounds Studio in Manhattan, NY where I was able to interview the stars of the evening. HBK: What does this night mean for you? Corduroy Jones: It means finally getting to display the music we worked so hard on. And have the inside feedback from the bloggers and the people on the inside that can actually move this thing forward… know what I mean, and help us to bring it to the world…bring an ear to it. So its definitely a big night for us…. and umm.. you know we are just going to capitalize on this from now. HBK: So Mike what are you feeling at this moment? Mike Dolla: At this moment I’m just..I’m Stoked. Like..It’s hard to really show it cause I’m under the weather right now, but umm.. glad that everybody got the chance to listen to the project that we put blood sweat and tears in..that’s about it. HBK: From this record what do you want your listeners to get from it? Mike Dolla: Well, each track is different I want them to feel the same exact emotion that we felt while recording the records. Corduroy Jones: Yes I just want them to feel like there’s a new wave..like there’s something… I want them to come away like wow I need more of it like its a drug .. so that’s pretty much how I want the listeners to feel. HBK: So what inspired the collaboration? Corduroy Jones: Well, like I said we know mutual people. Um.. Mike is from LA and my people, my cousins are from Yonkers so I heard about his grind and seen his grind on Instagram and he seen mine. And we just did one track and we started looking at each other and started knocking them out. and that’s how it came about.. so lines and hooks. Gone Fishing. HBK: You use to have another name Corduroy Jones? Corduroy Jones: My name was STRAWS back in the day and I left for five years, came back and just re-branded myself. HBK: Mike what is your main motivation to “making it” and making music? Mike Dolla: Yeah, I’ve been through ups and downs with this music situation…from writing music for Callswag district, young Money and never getting paid.. I didn’t know my business properly, but now I do…so I umm..right now I feel comfortable with this artist right here… Corduroy Jones… and we are about to reap all the benefits of our labor. HBK: So what brought you both to LMG? Corduroy Jones: Once again, it just connects itself.. my childhood friend is like the mentor and CEO of LMG and seeing him around I was just like keep doing you thing.. I reached out to him and vibes were good and he was with LMG so .. we here. HBK: How much feedback did you get? Mike Dolla: We got a lot of feedback.. no negative feedback. Corduroy Jones: For me personally I really want to see the posts and the write ups… that’s the results I’m looking for. HBK: What are you rocking right now? Corduroy Jones: Heart Clothing releasing in Fall 2014, My Success brand hat and black and white Jordan the ones on my feet. HBK: Mara what are you Views on the Gone Fishing Record? Mara: I thought the project was hot, you know I am very critical of hip-hop you know..so say too critical, but I am really happy with what I heard. I mean there were some spots that I was like umm, but then something that they said.. cause I listen to lyrics. I’m like oh snap okay.. some serious punch lines. Yes I was very happy and excited the project is coming out April 1st but like they mentioned we can download it tonight so that’s a good look. HBK” From what you are normally hearing in the Hip-hop music, do you think they are shying away from it or bring it back to what hip-hop used to be? Mara: I think they are bringing it back because for a while in hip-hop it wasn’t about lyrics.. it was about the beats… they could rap about BS but because of their beats they will sell. but now I think Mike and Corduroy are bringing it in terms of that. HBK: Will you be hosting more events with LMG? Mara: Of Course,I am good friends with JB the Founder so yeah.. but this is like my first hosting gig but I believe so. I’m used to interviewing people over the phone but hopefully we get to work together again soon. HBK: So right now what is your fashion about, what are you wearing? Mara: I don’t know what I’m wearing..lol. I am not really into fashion like that. the only person I get some fashion advice from is my hairstylist… before I leave the house he would tell me what works and if it doesn’t then I go back to the drawing board.. but usually the things I find in my closet is what works, that’s the best I can tell you. 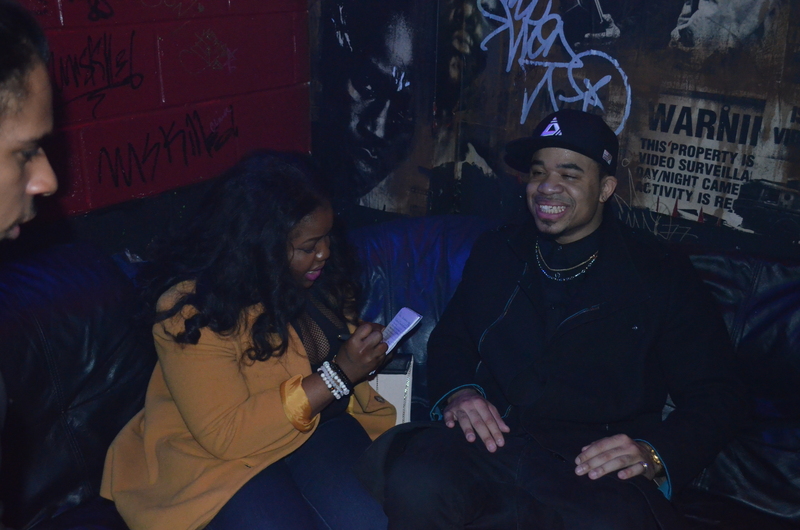 Last Saturday, February 22, 2014, I watched back stage as Bizzy Crook performed in front of hundreds of guests who arrived at the 1 year anniversary for the Respect the Next online site, Hosted by 1051 Breakfast Club’s Angela Yee and the amazing Madison Jaye. I was able to also steal Bizzy Crook from his sea of congratulating fans and friends for an interview back stage in the Press room. The 22 year old confident rapper made it clear that he has been rapping from the prime age of 6. When he gets on the stage he blacks out and lets his juices flow despite his past of being shy. He learned to perform from his most recent tour with Chris Webby. Chris mentioned that he loves performing in NY but Lancaster, PA and Upstate NY has been by far of his favorite places to perform. Though his last tour was his first, Bizzy has many well on their way. The most important things that the upcoming Rapper wants you to take away from his music is that “it is real and its an open journal to the world. Whether it’s about being suicidal or whether its about popping a hundred bottles of Champaign, if I say it, it happened”. For his fashion he wasn’t too particular he just pulled his outfit that same day, now that’s real! 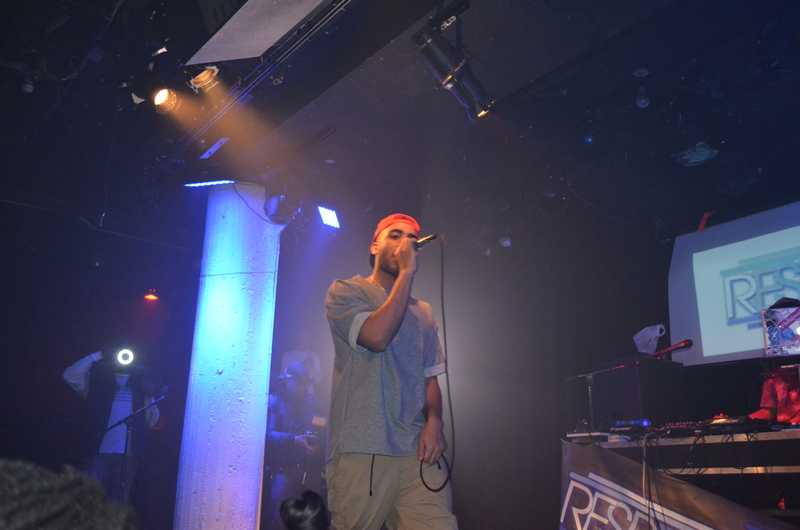 For more on updates follow Bizzy Crook on Instagram @BizzyCrook. Bringing you the best in the industries, it’s HBK. Peace, Love and knowledge. The Stage was diffidently on fire this past Saturday, February 22nd for the 1 year anniversary for Respect the Next online site as several performers took to it. Jay Pres to name a few was a highlight for the evening as his one man show sent the crowd wild. 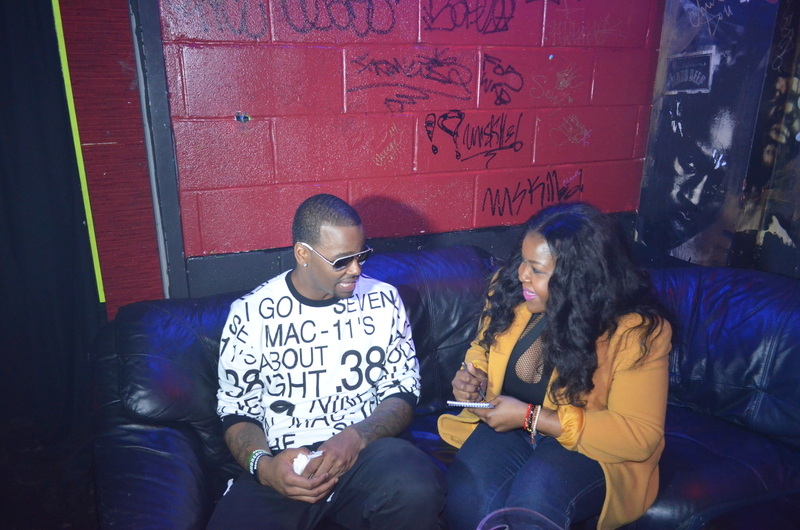 I had to Respect the next superstar and sit with him for an interview back stage. I must say the interview was rather smooth, and gave me the impression that he does this on a regular.Well Jay got comfortable and we began spilling his story. Raised in Harlem NY he had the luxury of Performing in California as well. Spending a little over 2 years rapping, Jay has really captured the flow of a true artist. 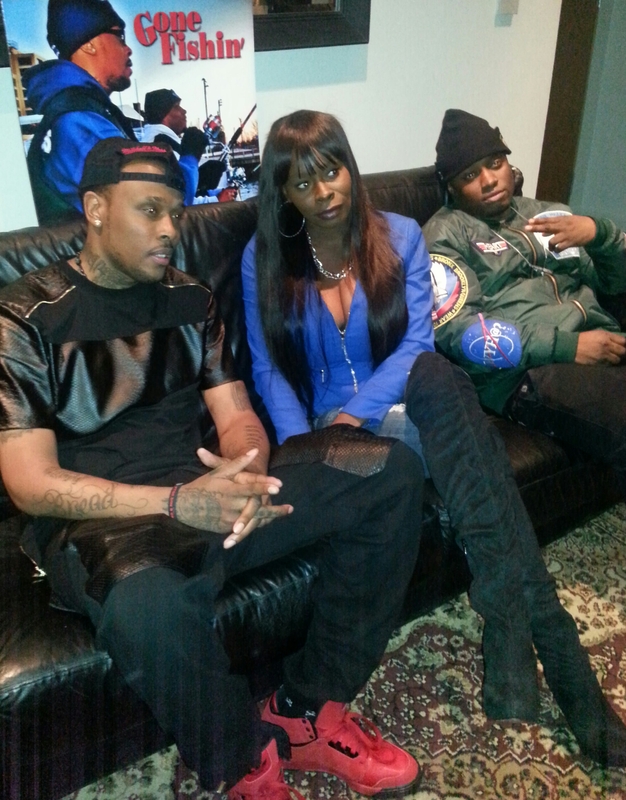 He has become very popular on world star as his recent video “Smokin’ Dope” released. Having male figures in his family that have been in the entertainment industry he found that music wasn’t an option it was thee option. Jay wants his fans to not just hear his music but to listen to his music, to be able to understand his metaphors and relate in some way as he tells a story. He doesn’t want to just make music, he wants to make music that you actually listen and vibe to. The rapper was casually rocking clothing from the Ryan Smith 2014 collection and fresh Oreo Jays (Jordans) on his feet to match. For more on on Jay for him on @JayPr3s on Instagram. Peace, Love and knowledge. 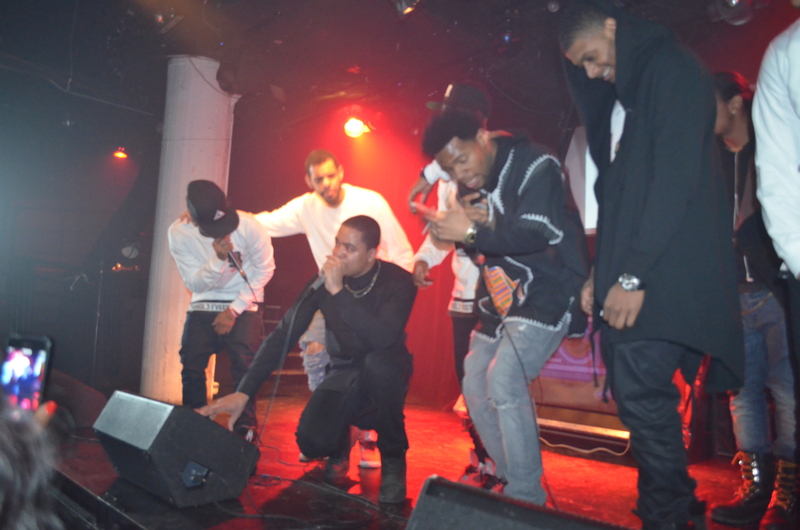 The passionate rap star, Chris Ferg was seen taking the stage with his Rotten Society team this past Saturday, February 22nd at Santos Party House in NYC for the 1 year anniversary of Respect the Next. I had the opportunity to both watch as he prayed with his crew back stage before performing and sitting with him after he finished killing the stage. For some we would think that Chris was rapping forever with a flow like his but talking to the emerging rapper, he has only been rapping for 6 months. anyone who meets Chris Ferg for the first time and agree that he is very humble and grateful for his upcoming rap career. The rapper was in tears after coming off stage, overwhelmed with emotion because he had the opportunity to perform with his cousin Michael Pharaoh. Though he is cousins with ASAP Rocky he has managed to find a place on his on in the rap game with his own team of Rotten Society. 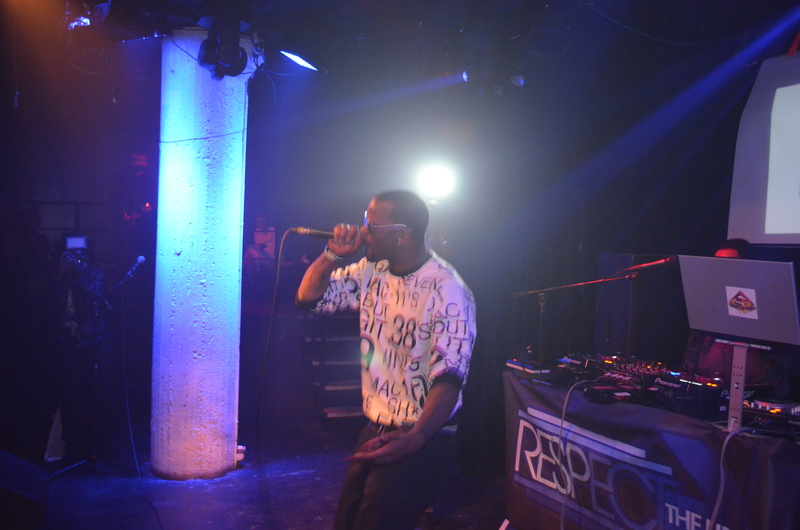 This happened to be my first time watching Chris Ferg perform, but according to him this was his third performance in NYC and he has also received love from South Carolina for his 1st ever performance. The rapper what would you want the world to remember his music for and he answered “that I have been an open book and that I was myself and original”. Even though he was modest I couldn’t help but ask about his attire, he was sporting a black shirt from Control sector, Black Jacket from Zara and footwear from a spot off of 23rd Street. Well there you have it, Chris Ferg’s sit down with HBK. For more updates follow Chris on Instagram @Newpagetherealchrisf3rg Peace, Love and Knowledge. You are very well spoken! Thank you so much. Your comment is appreciated. 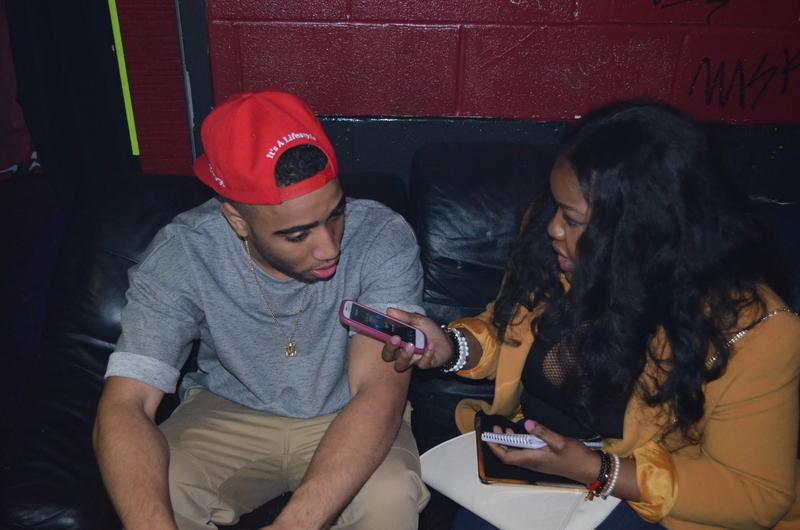 I know it’s late but Gurber is such a great guy…Shouts out to HBK for a great interview!